Having multiple streams of income is a strategy I've perfected over the years, and while most people are looking for that single magic formula to make them rich overnight, I've been quietly 'beating the street' by compounding my returns over time. Reinvesting dividend-yielding stocks representing excellent companies has been my ticket to wealth, and we are dedicated to identifying the top dividend stocks to boost your bottom line. At any stage of life, dividend stock investing is just a safe and smart way to allocate one's financial resources. Through the years, I've noticed that dividend-paying stocks that have been in business for a long time and tend to have less volatility than stock that don't fit that description. Dividend-yielding stocks also give investors a measure of confidence: only a company that has plenty of capital can afford to reward its shareholders with cash payouts on a regular basis. Besides, it's a nice gesture when a company rewards its faithful long-term shareholders with a dividend payout. In this day and age, there's no excuse not to include some decent dividend payers in one's long-term portfolio. It's not difficult to find out whether or not a particular stock pays out a dividend: this type of fact finding can be done on a computer or a smartphone. Furthermore, you can count on Wealth Research Group to provide you with the latest essential updates on great dividend stocks – we're here to help you find the absolute best opportunities out there. The dividend payout ratio is calculated as the total amount paid to shareholders (in dividend payments) divided by the company's net income during the past year; typically, this figure is expressed as a percentage. In other words, the dividend payout ratio represents how much of a company's annual income is being paid out as dividend payments to shareholders. It might seem like you'd want the dividend payout ratio to be really high, but if the payout is too high (for instance, if it's over 80%), then that could be a red flag because you'd have to wonder why the company wouldn't want to reinvest some of its profits in order to keep the company healthy and profitable. On the other hand, if the dividend payout ratio is too low, then you might wonder why the company is being so stingy with the payouts. It's all a matter of balance – a concept that we take very seriously. Another red flag to watch for is the super-massive dividend yield that some smaller companies might offer. Sure, it's nice to get a fat dividend payment, but I don't recommend being a 'yield hog' when it comes to dividends. If a company, especially a lesser-known company that doesn't have much capital, suddenly offers to pay a dividend over 10%, you have to wonder whether they can really afford such largesse. This level of generosity is oftentimes not sustainable and can lead to dividend cuts, which in turn can cause investors to lose faith and that could lead to a drop in the stock price – the last thing you really need as an investor. 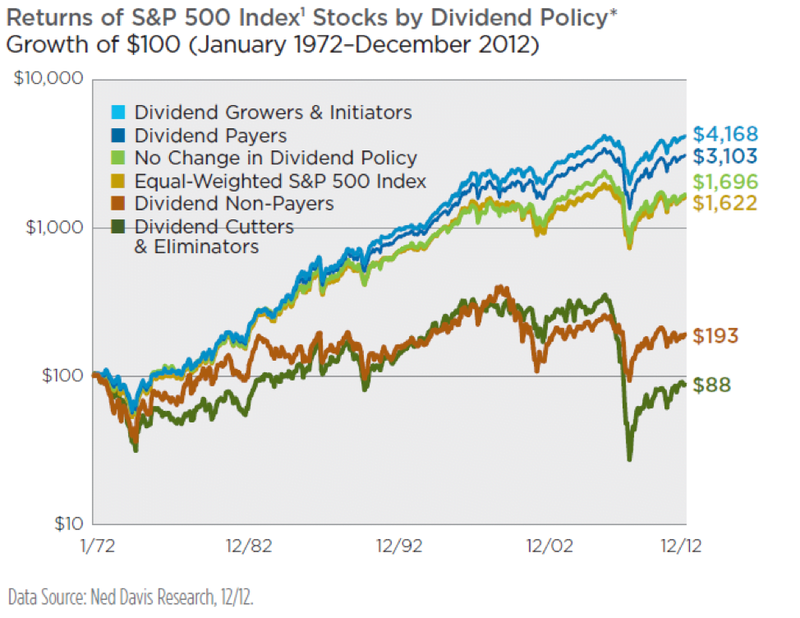 There's no doubt about it: dividend payers tend to outperform over time compared to dividend non-payers and dividend cutters. Even better than dividend payer are dividend growers: those companies that increase their dividend payouts (in percentage terms) on a consistent basis. These dividend growers include some of the best companies of all time – household names and legendary companies that have made savvy investors quite wealthy. There's no need to take chances with investments in questionable companies that haven't been properly vetted or researched. Look to dividend investing as a reliable and superior source of investment income that you can count on. Legal Notice: This work is based on SEC filings, current events, interviews, corporate press releases and what we've learned as financial journalists. It may contain errors and you shouldn't make any investment decision based solely on what you read here. It's your money and your responsibility. The information herein is not intended to be personal legal or investment advice and may not be appropriate or applicable for all readers. If personal advice is needed, the services of a qualified legal, investment or tax professional should be sought.